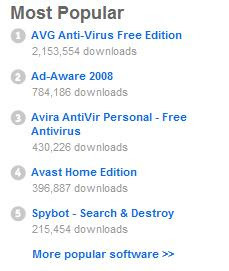 AVG Anti-Virus Free Edition is on top of Download.com's 'Most Popular/Downloaded' security software list. According to this list is AVG Anti-Virus leading with 2,153,554 downloads last week. Ad-Aware 2008 is in second place with 784,186 downloads, Avira AntiVir Personal is in third with 430,226 downloads, Avast Home Edition is in fourth place with 396,887 downloads, and Spybot - Search & Destroy is in 5th place with 215,454 downloads.